Background : Malnourished children suffer several alterations in body composition that could produce cardiac abnormalities. Aim : The aim of the present study was to detect the frequency of myocardial damage in malnourished children as shown by echocardiography and cardiac troponin T (cTnT) level. Methods : Forty-five malnourished infants and young children (mean±SD of age was 11.24 ±7.88 months) were matched with 25 apparently healthy controls (mean±SD of age was 10.78±6.29 months). Blood sample was taken for complete blood picture, liver and kidney function tests, serum sodium, potassium, calcium levels and cTnT. All the malnourished children were subjected to echocardiographic evaluation. Results : Malnourished children showed a significantly lower left ventricular (LV) mass than the control group. The LV systolic functions were significantly impaired in patients with severe malnutrition. The cTnT level was higher than the upper reference limits in 11 (24.44%) of the studied malnourished children and all of them had a severe degree of malnutrition. The cTnT level was significantly higher in patients with anemia, sepsis and electrolyte abnormalities and it correlated negatively with LV ejection fraction (EF). Six of the studied children with high cTnT levels (54.5%) died within 21 days of treatment while only one case (2.9%) with normal level of cTnT died within the same period. Conclusions: LV mass is reduced in malnourished children. Children with severe malnutrition have a significant decrease in LV systolic functions. Elevated cTnT levels in malnourished children has both diagnostic and prognostic significance for cardiomyocyte damage. The aim of this study was to detect the frequency of myocardial damage among malnourished children as shown by echocardiography and cardiac troponin T (cTnT) levels. The current study included 45 malnourished infants and young children diagnosed according to the Waterlow classification (1972). They were recruited from the Inpatient Department of Assiut University Children Hospital, Egypt. Their ages ranged from 2 to 30 months. There were 25 boys and 20 girls. Three children had first-degree marasmus (M I), 16 had second-degree marasmus (M II), 19 had third-degree marasmus (M III), four had kwashiorkor (KWO) and three had marasmic-kwashiorkor (M-KWO). Pre-term infants or intrauterine growth retardation at birth. Any documented cardiothoracic event (congenital heart disease, pericarditis, cardiomyopathy, acute severe lower respiratory tract infection, etc.). Severe anemia (blood hemoglobin level ≤6 g/dl). Serum sodium, potassium and calcium levels. Assessment of cTnT by electrochemiluminescence immunoassay (ECLIM) I intended for use on the Roche Elecsys 1010 immunoassay analyzer. The lower detection limit was 0.010 ng/ml. Values below the detection limit are reported as <0.010 ng/ml. LV diastolic function (E/A): using E/A ratio of the mitral flow by pulsed wave Doppler across the mitral valve. 2. Left ventricular mass (LVM)and left ventricular mass index(LVMI) It is performed using the LVMI calculator. [Table 1] shows some clinical and laboratory data of the studied patients compared with the control group. No statistically significant difference between patients and controls regarding the heart rate, the mean diastolic and systolic blood pressure, liver and kidney functions could be detected. [Table 2] shows the echocardiographic findings of patients with PEM compared with the controls. The cTnT level and the echocardiographic findings of different groups of malnutrition and controls are shown in [Table 3]. A weak insignificant positive correlation was found between either LVM or LVMI and the body mass index (BMI) (r=0.128, P=0.403 and r=0.126 and P=0.411, respectively). In the present study, the cTnT levels were higher than the upper reference limits in 11 of the studied malnourished children (24.44%) and all of them had a severe degree of malnutrition; six (54.5%) had M III, two (18%) had KWO and three (27.7%) had M-KWO. [Table 4] shows some laboratory and echocardiographic parameters of malnourished children with normal cTnT levels compared with those with high cTnT levels. The cTnT level was significantly higher in patients with anemia, electrolyte deficiency and sepsis. [Figure 1] shows a significant negative correlation between cTnT level and LVEF, r=-0.213, P=0.043. Six of the studied children (54.5%) with high cTnT levels died within 21 days of treatment while only one case (2.9%) with baseline level of cTnT died within the same period. [Table 5] shows some laboratory and echocardiographic parameters in the studied patients with PEM according to the outcome. LVM is reduced in malnourished children. Children with M III, KWO and M-KWO have a significant decrease in LV systolic functions. Elevated cardiac troponin levels in patients with PEM has both diagnostic and prognostic significance for cardiomyocyte damage. 1. Kalantar-Zadeh K, Anker SD, Horwich TB, Fonarow GC. Nutritional and anti-inflammatory interventions in chronic heart failure. Am J Cardiol 2008;101:89E-103E. 2. Padulaa G, Salcedac SA, Seoanea AI. Protein-energy malnutrition contributes to increased structural chromosomal alteration frequencies in Argentinean children. Nutr Res 2009;29:35-40. 3. Olivares JL, Vazquez M, Rodrguez G, Samper P, Fleta J. Electrocardiographic and echocardiographic findings in malnourished children. J Am Coll Nutr 2005;24:38-43. 4. Gray VB, Cossman JS, Powers EL. Stunted growth is associated with physical indicators of malnutrition but not food insecurity among rural school children in Honduras. Nutr Res 2006;26:549-55. 5. El-Sayed HL, Nassar MF, Habib NM, Elmasry OA, Gomaa SM. Structural and functional affection of the heart in protein energy malnutrition patients on admission and after recovery. Eur J Clin Nutr 2006;60:502-10. 6. Ocal B, Unal S, Zorlu P, Tezi HT, Oguz D. Echocardiographic evaluation of cardiac functions and left ventricular mass in children with malnutrition. J Paediatr Child Health 2001;37:14-7. 7. Ammann P, Pfisterer M, Fehr T, Rickli H. Raised cardiac troponins. BMJ 2004;328:1028-9. 8. Gunnewiek JM, Van Der Hoeven JG. Cardiac troponin elevations among critically ill patients. Curr Opin Crit Care 2004;10:342-6. 9. Thiru Y, Pathan N, Bignall S, Habibi P, Levin M. A myocardial cytotoxic process involved in the cardiac dysfunction of meningococcal septic shock. Crit Care Med 2000;28:2979-83. 10. Wright RS, Williams BA, Cramner H, Gallahue F, Willmore T, Lewis L, et al. 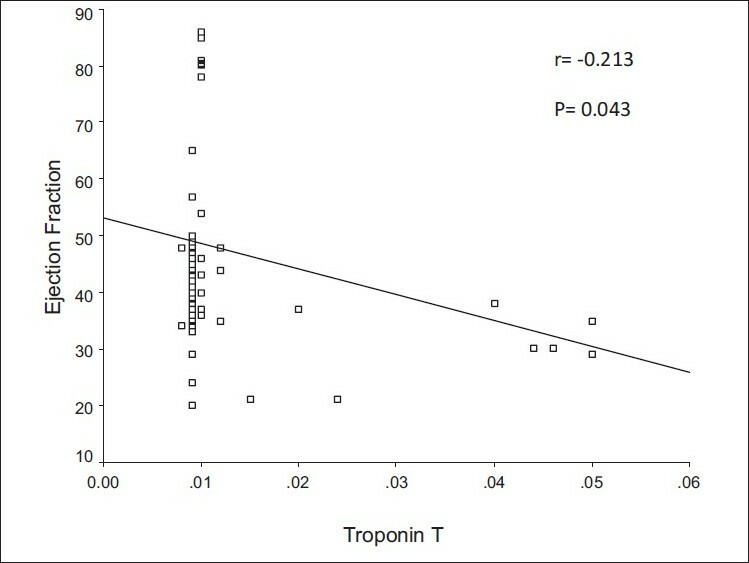 Elevations of cardiac troponin I are associated with increased short-term mortality in noncardiac critically ill emergency department patients. Am J Cardiol 2002;90:634-6. 11. Ver Elst KM, Spapen HD, Nguyen DN, Garbar C, Huyghens LP, Gorus FK. Cardiac troponins I and T are biological markers of left ventricular dysfunction in septic shock. Clin Chem 2000;46:650-7. 12. Ammann P, Fehr T, Minder EI, Gόnter C, Bertel O. Elevation of troponin I in sepsis and septic shock. Intensive Care Med 2001;27:965-9. 13. Checchia PA, Appel HJ, Kahn S, Smith FA, Shulman ST, Pahl E, et al. Myocardial injury in children with respiratory synctial virus infection. Pediatr Crit Care Med 2000;1:146-50. 14. Khan IA, Tun A, Wattanasauwan N, Win MT, Hla TA, Hussain A, et al. Elevation of serum cardiac troponin I in non cardiac and cardiac diseases other than acute coronary syndromes. Am J Emerg Med 1999;17:225-9. 15. Ammann P, Maggiorini M, Bertel O, Haenseler E, Joller-Jemelka HI, Oechslin E, et al. Troponin as a risk factor for mortality in critically ill patients without acute coronary syndromes. J Am Coll Cardiol 2003;41:2004-9. 16. Mehta NJ, Khan IA, Gupta V, Jani K, Gowda RM, Smith PR. Cardiac troponin predicts myocardial dysfunction and adverse outcome in septic shock. Int J Cardiol 2004;95:13-7. 17. Waterlow JC. Classification and definition of protein-calorie malnutrition. Br Med J 1972;3:566-9. 18. Cairo University. Diabetic Endocrine and Metabolic Pediatric Unit and the National Research Centre-Cairo, in collaboration with Wright State University. School of Medicine. Department of community Health Lifespan. Health Research Centre. From a sample size of 33189 boys and girls (birth-21 year). 19. Kurowski V, Hartmann F, Killermann DP, Giannitsis E, Wiegand UK, Frey N, et al. Prognostic significance of admission cardiac troponin T in patients treated successfully with direct percutaneous interventions for acute st- segment elevation myocardial infarction. Crit Care Med 2002;30:2229-35. 20. Salem M, El Behery S, Adly A, Khalil D, El Hadidi E. Early predictors of myocardial disease in children and adolescence with type 1 diabetes mellitus. Pediatr Diabetes 2009;10:513-21. 21. Khositseth A, Suthuvoravut U, Chongviriyaphan N. Cardiac dimentions and function in children with obesity. Indian Heart J 2006;58:422-5. 22. Taksande A, Vilhekar K, Jain M, Ganvir B. Left ventricular systolic and diastolic functions in patients with sickle cell anemia. Indian Heart J 2005;57:694-7. 23. Feigenbaum H In: Feigenbaum H, Armstrong WF, Ryan T, editors. Textbook of Echocardiography. 6 th ed. USA: Lea and Febiger; 2005. p. 68-173. 24. Mc Donald IJ, Feigenbaum H, Chang S. Analysis of left ventricular wall motion by reflected ultrasound: Application to assessment of myocardial function. Circulation 1972;46:14-25. 25. WHO. Management of sever malnutrition: A manual for physicians and other health workers. Geneva: World Health Organization; 1999; 97/11527- Best- set/ Clays- 8500. 26. Abo-Shousha SA, Hussein MZ, Rashwan IA, Salama M. Production of proinflammatory cytokines: Granulocyte-macrophage colony stimulating factor, interleukin-8 and interleukin-6 by peripheral blood mononuclear cells of protein energy malnourished children. Egypt J Immunol 2005;12:125-31. 27. Cunha DF, Cunha SF, Reis MA, Teixeira Vde P. Heart weight and heart weight/ body weight coefficient in malnourished adults. Arg Bras Cardiol 2002;78:382-7. 28. Singh GR, Malathi KE, Kasliwal RR, Ommar A, Padmavati S, Ramji S. An evaluation of cardiac function in malnourished children by non-invasive methods. Indian Pediatr 1989;26:875-81. 29. Phornphatkul C, Pongprot Y, Suskind R, George V, Fuchs G. Cardiac function in malnourished children. Clin Pediatr (Phila) 1994;33:147-54. 30. Kothari SS, Patel TM, Shetalwad AN, Patel TK. Left ventricular mass and function in children with severe protein energy malnutrition. Int J Cardiol 1992;35:19-25. 31. Shoukry I, Shoukry AS, Ibrahim MM, Fahmy N, Madkour MA. Cardiac atrophy and ventricular function in infants with protein calorie malnutrition. In: Doyle EF, Engle NA, Gersony WM, Rashkind WJ, Talener NS, editors. Pediatric cardiology. Vol. 44. New York: Springer Verlag; 1986. p. 1169-71. 32. Bergman JW, Human DG, De Moor MM, Schulz JM. Effect of Kwashiorkor on the cardiovascular system. Arch Dis Child 1988;63:1359-62. 33. Steven EL, Nader R, Stephen ES, Stuart RL, Virginia D, David BS, et al. Predictive value of cardiac troponin T in pediatric patients at risk for myocardial injury. Circulation 1997;96:2641-8. 34. Gomes AV, Barnes JA, Harada K, Potter JD. Role of troponin T in disease. Mol Cell Biochem 2004;263:115-29. 35. Kontos MC, Fritz LM, Anderson FP, Tatum JL, Ornnato JP, Jesse RL. Impact of the troponin standard on the prevalence of acute myocardial infarction. Am Heart J 2003;146:446-52. Brent, B. and Obonyo, N. and Maitland, K.